She is seriously tripping right now. I don't know what's better. Breadface or the stoned out of her mind old lady. nanananananananana BREAD MAN! BREEEEAD MAAAAN! She gave him a yeast infection. Some Indonesian Forms of the Hiccup cure involve a grandmother, Loaves of bread, and a Dance that can only be described as, "Lustful". french-loaf-a-tron transform and roll out! always worth a while watching! 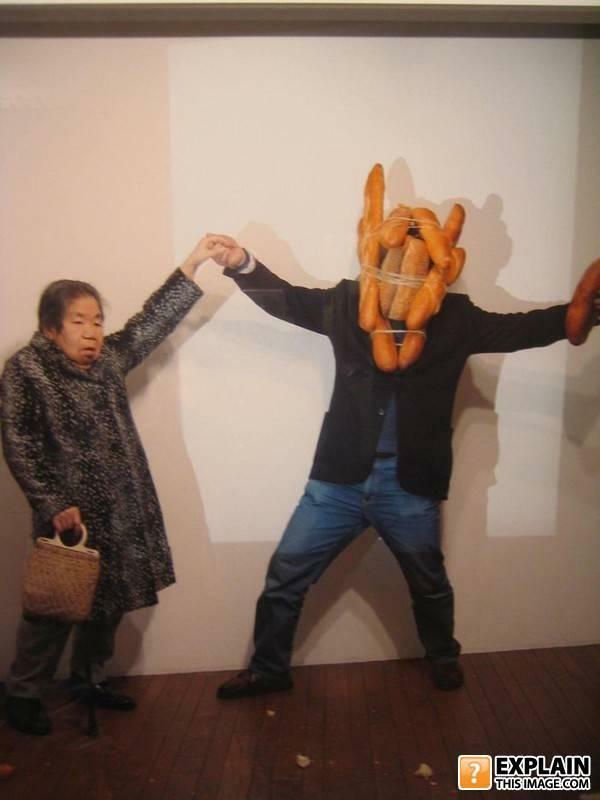 The asian version of that episode where Jerry Seinfeild steals an old lady's bread. Woke up with bread-head today. man-with-buns-for-face strikes again, this time preying on helpless in an elevator!!!!!! The whole tribe was thrilled when their shaman took over the Rez's Bakery. I believe its a danish artist called Søren Dahlgaard, he calls himself the doughwarrior! hahaha, here his website: http://www.sorendahlgaard.com.... enjoy! Mother's pride. Despite his condition he always bring the bread home. (In my best Adam Sandler impression) I'm crazy Bread-for-a-head Man, give me some candy! Still more facial expressions than Kristen Stewart. Sir, your loaf is leaking all over the floor. You death women,,, i didnt say give me bread ,,, i said give me head!!!! Finally! A solution for acne. O thank god its breadman! The devil has landed and the reports of his evilness is greatly exaggerated. This is why you should never eat bread at an asian restaurant. Replacements for everything she's missed dating Asian guys. That´s the knew dance move called...bread roll. Should of worn a condom. Side effects are shown above. Sir, I asked you to help me carry my bread, not this. Silent Hill Pyramid Head Auditions. All that Saki and no lampshades equals improvisation! C´mon!!! All your breadcrumbies or ur life!!!! We have so much food in North Korea that we wear dem shits! Lil old lady..."I wore my faux leopard jacket and basket purse for this? honey you've got to come home now you're scaring the baker. I hate when you wake up with bread head. As the others said, that is just bread man the horribly disfigured remains left after being attacked by the Nazi bear, doing a good deed. Baguettes are robbing old ladies now. mom, can we just get a bag next time? Another day saved from sanity by Yeast Man! It's okay, neither has he. -Your feet must be tired 'cuz you've been running through my mind. -Yea, I was running away from you.